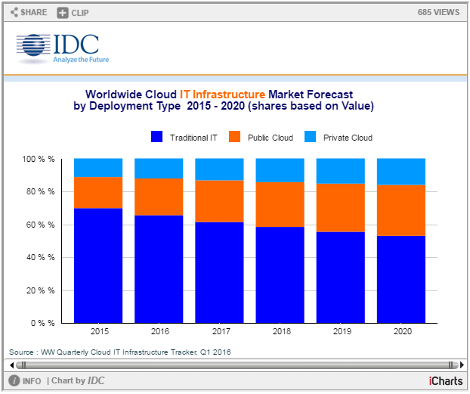 Public cloud providers will accelerate spending on data center hardware (servers, storage, and Ethernet switches), in the second half of the year, while spending on IT gear for traditional on-premise enterprise data centers will decline slightly, according to the latest data from IDC. On-prem IT infrastructure will still account for more than 60 percent of all end-user hardware spending this year, these end users will have spent 4.4 percent less than they spent in 2015, according to the analysts. This is while public cloud providers are projected to increase their annual data center hardware spend by close to 19 percent this year, collectively buying $23.3 billion worth of equipment. Also growing is spending on hardware to build on-premise private clouds. IDC expects spending in this category to increase by more than 10 percent this year, reaching $13.8 billion. About 60 percent of the total will account for on-prem private cloud deployments. The forecasts are good news for the data center provider industry. Both the projected 19 percent uptick in public cloud hardware spending and the 10 percent uptick in private cloud hardware spending translate for more demand for data center capacity. The biggest data center providers are already enjoying a seller’s market as a result of an ongoing data center land grab by the hyperscale cloud giants, and many of them also have enterprise market strategies, chasing those on-prem deployments by enterprise IT shops and in most cases offering those customers the opportunity to combine their private infrastructure with access to public cloud providers from the same campuses. Read more: How Long Will the Cloud Data Center Land Grab Last?